In the traditional Syrian households, kitchen is the woman territory. Dad brings the food, mum cooks the food. I like to believe that this family module is changing. More and more family are breaking this rigid structure, may be very slowly but continuously. May be it is just my liberal brain convincing me that things are changing. I don't know! Regardless of how traditional, liberal, backward or progressive a family is, two meals remain the father duty. First is, no surprises there, barbecue. Lighting a huge fire, grilling big pieces of meat and filling the place with smoke brings the cave man out of all of us men. We just love it. The second father's specialty is Friday's breakfast. Friday as many of you know is the day of rest for Muslims so the weekend across all of the Arabic and Islamic countries will be Friday with either Thursday or Saturday. In Syria people will have a lie-in on a Friday morning and the breakfast will be served in late morning, more like a brunch, before people head for Friday's prayer around midday. The Friday's meal will feature the usual breakfast items olives, white cheese and labneh. But it will not be a proper weekend breakfast if it didn't include Hummus Fatteh or Ful Mudamas. Ful is Arabic for Fava beans or braod beans whichever way you want to call them. Ful Mudamas is a vegetarian warm broad bean salad dish eaten as a filling breakfast or a nice supper. Although Ful Mudamas is the official name of the dish we hardly ever use this name. We simply refer to it as a generic Ful or we call it by the name of its two variations, Ful bi Laban (youghurt Ful) made with a youghrt sauce or Ful bi Ziet (oil ful)which looks more like a salad and uses more olive oil. For this recipe you can use home cooked dry broad beans as in my Ful Nabit post but to be honest with you the skins remains tough unless you cook them for long time with plenty with Sodium Bicarb. You wouldn't do that in Syria and you will buy your beans ready cooked from the Ful and Hummus shop. Here in London you can buy tinned ful. There is a huge variety in any Middle Eastern supermarket. Some of the tinned ful comes in a variety of flavours and different Middle Eastern recipes. I like to buy a plain ful and chickpeas tin and I do the flavouring myself. Heat the beans with water in a pot or simply empty the can contents into a bowl, cover and microwave for two minutes. Drain the beans and let cool down . They need to be warm but not too hot as the yoghurt will curdle. Mix the youghrt, tahini, crushed garlic, salt and squeeze of a lemon and mix together. The mixture will stiffen because of the tahini. Add a little bit of water at a time and whisk. You need a fairly loose consistency. Adjust the quantities according to taste. I like more tahini and less lemon but try till you get the taste you like. Chop the tomato and add to the yoghurt sauce. Add the warm beans and mix together. Transfer to a large bowl or individual portions. Decorate with paprika, chopped parsley and a generous drizzle of olive oil. Serve with warm bread, a quartered onion and some pickles. 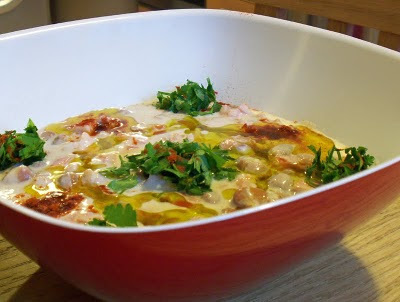 I love anything smothered in tehina and yogurt sauce, this recipe looks wonderful. Last Friday we had hummus ful at the local Yemenite diner, it isn't a Yemenite dish of course by they like it well enough to incorporate it into their everyday cooking. Kano, this is beautiful. I haven't had this in years and I just found out that I really miss it. I am certainly going to do that very soon. Although people from Yemen don't have hummus as part of their native diet, they do have their own version of Ful. And not a bad one either. I grew up in south Saudi Arabia not that far of the Yemeni border. The area local cuisine was very close if not identical to that of Yemen. The Yemeni ful is cooked with the flavouring ingredients (tomato, peppers and cumin I think). The beans are mashed into a thick soup consistency. I never made pickles myself but I am off to Syria in a couple of weeks time. I will get my mum recipe and give it a go. What a beautiful dish for brunch. And perfect for our hot Februaries. I am off to find a tin of ful and chickpeas! ahhh, the ful bil leben I've been waiting for... ;) thanks! In fact, I just had ful biz-zeit the other day, and also tried the fried egg plants, but somehow they where a bit too oily for my taste. I go alnog with Rania here: please let us know how to do the pickles. I'm in Tunisia at the moment, and although the pickles here aren't bad either, I still miss the Syrian style pickles. Kano - thanks for sharing your version. chuffed that I've come across your blog, am always on a look out for middle eastern eateries in London! I was not aware of this recipe for ful. Love it though, it has all the ingredients I need to be happy! I just made a ful dish from Tripoli called "fouliyeh" with rice and pomegranate molasses. Would never have thought of having this a brunch dish, but now I'm sold on it. You used to be able to buy Ful Mesdamess on every street corner when I was in Egypt - hopefully that hasn't changed. Hadn't come across them with yogurt before though. Wonderful recipe, Kano. The cans of fava beans I buy here in the U.S. usually are imported from Lebanon. The bean, to me, doesn't look anything like fresh ful, which is only available in summer. My mother used to cook ful with the skin on for a long time until it turned brown, with water and allspice. I haven't had that for years. I hope you find the tinned broad beans I would love if you can try it. It will be a great dish for you Yam Daisy menu. A meal for two that cost less than £2. Try it and let me know how it goes I hope it tastes similar to the one you had in Syria. Recipes vary a lot even from shop to another. Pickles recipe on its way soon. Promise. Welcome to my blog. I am glad you like Middle Eastern food and you like my blog. Regarding Ful, every Arabic country have their own version. I am surprised you didn't know this recipe. How do you make Ful in Lebanon? I saw your Fouliyeh recipe. We have a dish called Riz Bi Ful, similar but no Pomegranate Molasses. The yoghurt variation is a Syrian specialty. Another unique way to Syrian Ful is we keep the beans whole while most other countries mash the beans. For Ful modamas I use the tinned beans as even in Syria we use dry beans rather than fresh for this one. For all other Ful recipes I use fresh or green frozen if out of season. @Kano I had it yesterday, it was delicious. I used canned beans that came with tahine already (the can sad Egyptian ful), because for some reason I couldn't find any tahine in this country, and was a bit sceptical at firs, but it was alright. The way I remember it from Syria was without tahine and tomatoes, but I like the tahine cause it makes the sauce a bit creamier, and the tomatoes cause it doesn't turn out quite so heavy - they sort of give it a fresher taste. @tasteofbeirut Ful with pomgrenade molasses and rice? That sounds interesting. do you have a recipe around somewhere, by any chance? I would like to try that. Fattet hummus is a completely different dish. As far as I know Palastenian Ful is made with the beans crushed (this the case in almost all Arabic versions apart from Syria). It is commonly served as a hummus topping. Oh yum! Is there a brand of tinned ful that you would recommend looking out for? 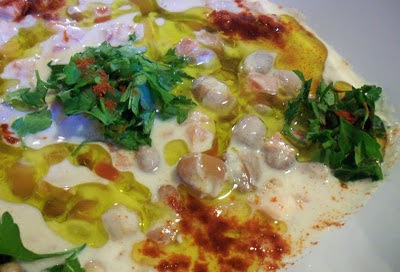 My aunt used to cook Egyptian style ful medames with the slow cooked eggs on the side reasonably often. I love it, and I think it'd make a brilliant breakfast. I heard of lablabi but never tasted it. Need to look up a recipe. The most available (and good quality to be fair) is California Garden. The only problem that they come ready mixed with the tahini, garlic, oil ...etc. It is not easy to find the plain variety of that brand. There are few other brands around in Middle Eastern shops but I can't remember any at this minute. Look delicious, reminds me of my five years in Cairo. Must go get some Ful from Bologna's only source! Thank you so much Kano! I've been making Foul for breakfast for years now, but could never get my beans to soften right, no matter how much I boiled them. I just tried your Bicarb of Soda hint and their texture is *so* much better! @kano basically, prepare a chick pea broth, break some of yesterday's bread (usually baguette or sth similar) into a big bowl (make sure the pieces are relatively small), pour the broth over it, so that the bread gets soaked add quite a bit of cumin, harrissa, garlic, and if you like tuna, olive oil and one or two eggs, that have only been cooked for a minute or two (so that the egg white is still runny). Mash the whole thing and enjoy. It doesn't look very nice, but tastes good! Thank you for stopping by. Try the Syrian way, completely different from Egyptian Ful. You welcome. Sodium Bicarb is essential for boiling both Ful and chickpeas for hummus. The moghrabia recipe looks great. Keep the nice recipes coming. Sounds delicious, although I can imagine it doesn't look that appealing. I especially like the tuna and eggs combination. They use that in few Tunisian dishes as far as I know. Dear Kano i love your blog and you dont know how much it helps me. I cook your recipes for my syrian bf and he loves it, he keeps asking how you know this food! i cheat from ur blog lol. i made most of them. just wanted to say thank you and ask you if you have grape leaves recipe from damascuse, i would love to make it. Lol! I am glad to be of help. Welcome to my blog. What was your best recipe you cooked? The grape leaves recipe will be on the blog in April. I promise. Thank you for asking. As you can see I am not writing these days (months in fact. when I get back to writing I will do few posts on Kibbeh. Do you know ANYWHERE in London that does Foul bi Leben? Desperate to find somewhere - I miss it so much, used to have it every day when living in Damascus. I hop[e you like the recipe and get the chance to try many more. Ful Nabit, Damascus favourite snack.